The house is beautifully appointed and decorated throughout. There is the advantage of underfloor heating and central heating making this a warm and comfortable place to stay throughout the year. Kitchen/breakfast room: A superb light and airy room with glazed bi-fold doors opening out to the private garden. It has been thoughtfully equipped with everything that guests could need including a range cooker, halogen hob, microwave, dishwasher, full height larder fridge and breakfast bar. Utility Room: has a fridge/freezer, washing machine, tumble dryer, Belfast sink and additional cupboard space. Sitting Room: Wonderful light and spacious room with doors opening out to the terrace. There is a wood-burning stove, two large comfy sofas, armchairs, Sky TV, DVD/Blue Ray player. Guests have the use of free fibre-optic wifi included throughout their stay. Bedroom 5: A light room at the front of the house with full-size twin beds, bedside table and lamp, chest of drawers. Shower room: located next to the bedroom with a shower cubicle, hand basin, WC, heated towel rail. There is a wide staircase with a banister. Sitting Room: a fantastic room with a large feature window overlooking the garden and open countryside. Beautifully furnished in a contemporary coastal style with large L-shaped sofa and a large flat-screen TV. Bedroom 1: Gorgeous room with a super king-size bed (6 ft), bedside table and lamps, ample storage space with built-in cupboards with shelving and a built-in wardrobe, TV. En-suite bathroom: really spacious with a large walk-in shower, separate bath with mixer taps, hand basin, WC and heated towel rail. Bedroom 2: Lovely countryside views over the back. There is a king-size bed (5 ft), bedside tables and lamps, built-in wardrobes. En-suite shower room: spacious with bath with shower over, hand basin, WC and heated towel rail . 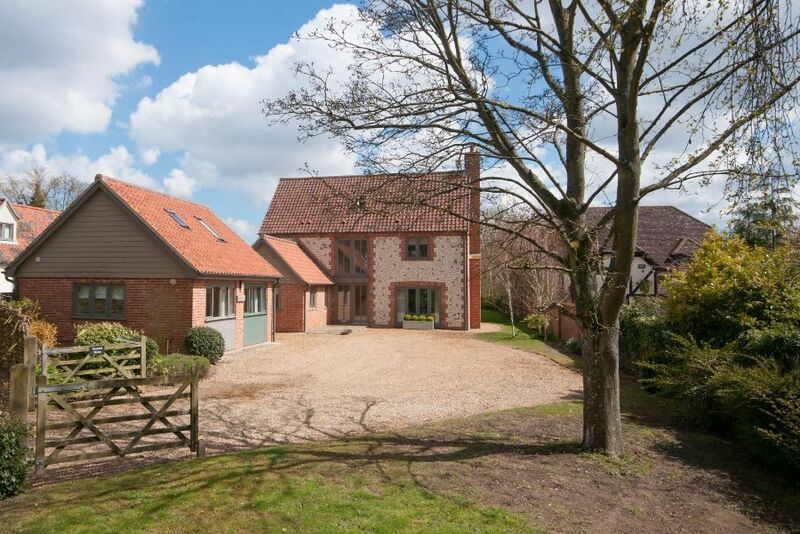 Orchard House is located along Herrings Lane with a large shingled driveway and parking space for up to five cars at the front. There's an attractive private lawned rear garden with a terrace and garden furniture which includes a large outside table, parasol and chairs, charcoal barbecue. Guests should be aware that from the back garden there is open access to the front garden which has a five bar gate, however there is a raised grassy bank bordering the quiet lane, meaning that the grounds are not fully secure.